Beth Mead's goal against Japan meant more than just a single trophy win, writes Carrie Dunn. 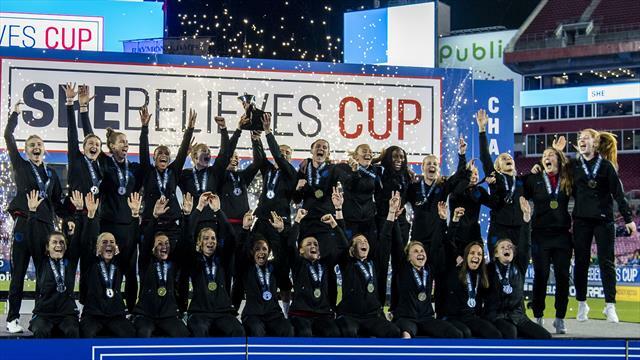 When Beth Mead fired home England’s third goal against Japan in Tampa, it was not just a strike that clinched the Lionesses’s first-ever triumph in the SheBelieves Cup. It was the strike that announced to the world that this team are genuine Women’s World Cup contenders. The USA’s invitational – which has operated for four years – has always been intended for four elite teams. The previous three tournaments have involved the quartet of the hosts, Germany, France, and the Lionesses. With the two other European teams staying at home this time, England became the highest-ranked team in the competition save for the USA. The Lionesses had come second in last year’s invitational, finishing with a win, a draw and a loss to tuck in as runners-up behind the USA. They were so close, and yet so far. They had finished third in the 2015 Women’s World Cup, and made the semi-finals of the 2017 European Championships; they were impressive in Canada but perhaps destined to be categorised as ‘there, or thereabouts’, always chasing those at the top. This time, the past two World Cup winners were in the USA ready for this test of preparation – the hosts, of course, plus Japan, who won the 2011 edition in Germany. But there is more history to it than that. Anyone who stayed up to watch the Lionesses’ campaign in 2015 will remember that semi-final, when England were holding the Nadeshiko to a 1-1 draw until the fateful final seconds of added time. Laura Bassett stuck out a leg in an effort to make a necessary clearance; misfortune and physics took the ball into the back of the net, and Japan through to the World Cup final. Four years on, Bassett was in a TV studio ready to watch the action from Tampa. Now a mother to a newborn, she talked calmly about what must remain the worst moment of her career. Over the next 90 minutes, the next generation of Lionesses exorcised Bassett’s demons for her. Because England’s 3-0 win over Japan was not lucky. This was certainly their best performance of the week – possibly their best performance during Phil Neville’s tenure. Their passing was slick, their vision was good. The changes the coach had made to the starting line-up were impactful. Jodie Taylor, who has flitted around in club football but has always looked at home at international level, sliced through the defence at will. Beth Mead, so impressive during her years at Sunderland yet overlooked for a senior call-up, created havoc. Despite the squad rotation – which is to be expected in a short-form tournament – there were some great shows of consistency too. Keira Walsh, still only 21, was a stalwart in the middle of the park, brave in defence, creative going forward. Neville opted to move Lucy Bronze around the field in all three games, shifting her from her usual slot at full back into midfield, and later praising her as the “best in the world”. England had broken the hex Germany had over them in the 2015 third-place play-off. Fara Williams's penalty in extra time in the Commonwealth Stadium in Edmonton secured the bronze medal - and the Lionesses's first ever win over the then top-ranked side. That comfortable, cruising victory in Tampa over Japan has buried the bad memories of four years ago - and shown the world that the Lionesses can beat the best. In France this summer, they will be genuine contenders, with a strong squad and a strong spirit.